During the last several years ghost photography, has made a major change. Even in the earliest years of photography, there was the appearance of Ghosts. some of the more famous ones would include images like Raynham hall spirit of Dorothy Walpole of East Anglia, England. It seems that for the first several decades of this type of photography, the ghosts always had a definite human or animal shape. Photographs from this period usually had some sort of translucent figure that would include a floating head, eyes, arms, face or even a complete figure. 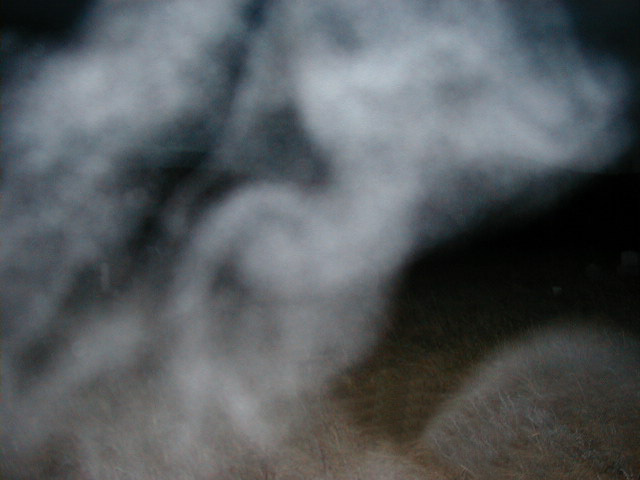 Usually photographs of spirits were taken by using several different techniques. The different kinds of techniques are. Using a device to trip the shutter when there is a sound, a change in light, a change in temperature or electromagnetism, or by when the photographer saw something. 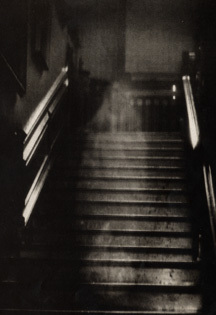 Ghost photography in the past several years has become something different. 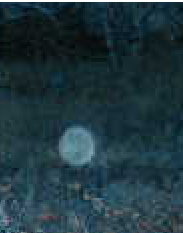 The latest ghost photos no longer include images of human or animal shapes, but now they have orbs and vortexes. 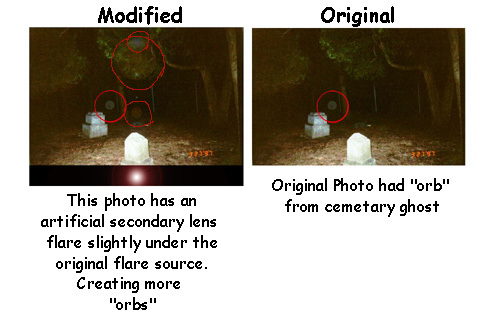 Some samples include images taken by a new breed of ghost hunter. This new photographer attempts to capture an image by taking photographs randomly in a haunted location. Usually without even researching the history of the haunt. These newest photos have been taken with digital high tech equipment, that has yet to be certifiable to its ability to generate images that are not influenced by other sources, such as interference from other digital equipment, standard camera flashes, different sources of interior lighting and household appliances. We need to take an open minded (Rational) approach but still have the ability to look at the evidence and examine it without a over zealous approach. One of the current problems in this field is the want for the researcher to see an image in a photograph. This can cause people to misjudge images and see things that just aren't there or can easily be explained by natural conditions or occurrences. We have replicated some examples by placing a digitally created flash in the same general area as the flash in the original photograph and this was the result. Please feel free to e-mail the R.M.P.R.S. your comments or photographs, we will always try to help and approach things with an open mind.